Please note- the new Executive Lounge is now located on the first floor. Walk into the Hilton San Antonio Hill Country Hotel - Spa and the essential elements that make up a true Texas experience are evident. 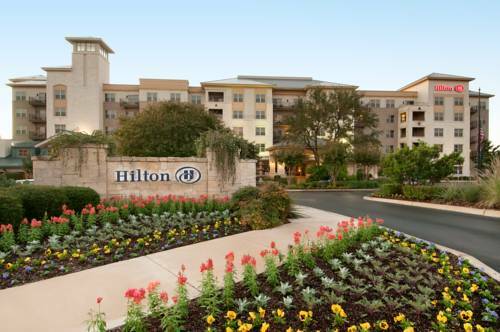 The Hilton San Antonio Hill Country offers a luxurious modern ranch lifestyle. Soaring beamed ceilings warm rich woods a massive flagstone fireplace cozy sofas plenty of barstools lining the thirty foot curved bar and wide bi-fold doors allowing in the fresh Hill Country air all provide guests with the right ambiance to kick off their boots and stay awhile. The warmth of the hotel*s Hill Country Bar conveniently located in the heart of the resort is so appealing that guests find themselves drawn to it at all times of the day and night. The hotel provides a number of unique guest services including three pools the Hill Country Spa it*s signature restaurant Sun Spot and all day dining in the Hill Country Bar which serves traditional American and Texas cuisine. Located in the rolling hills dotted with centuries old live oaks and indigenous plants the Hilton San Antonio Hill Country Hotel - Spa is just twenty minutes from San Antonio*s International Airport world-famous Riverwalk and historic Alamo. Just one-half mile from Sea World the Hilton San Antonio Hill Country Hotel - Spa is an ideal location for endless hours of fun and relaxation. The Hilton San Antonio Hill Country Hotel - Spa tucked into the rough and rugged Hill Country offers a gracious blend of Texas hospitality and superior amenities. All of our well-appointed guestrooms and suites offer a pleasant haven from the stress of the modern world. The handsome rooms are decorated in soothing tones reflective of the Hill Country*s natural fauna. The generously sized baths are well-stocked with thick white bath towels and Hilton*s signature Crabtree - Evelyn products. Suites feature whirlpool baths and rain forest showerheads. A credit card guarantee is required on all reseervations regardless of arrival time. Individual plans may vary. See rate details for more information. RESERVATIONS MUST BE CANCELED 3 DAYS PRIOR TO ARRIVAL DATE TO AVOID A PENALTY OF ONE NIGHT ROOM AND TAX CHARGE. *NOTE-INDIVIDUAL PLANS MAY HAVE VARYING CANCELLATION POLICIES. Enjoy dining in the privacy of your guest room. Whether you choose breakfast lunch dinner or just snacks it will be perfectly prepared as you wish when you wish. - Maxim Integrated Products Inc.
~12 miles from San Antonio. The World's Largest Cowboy Boots are ready to kick s**t at the North Star Mall. ~45 miles from San Antonio.